As an organization, we have always felt the importance of thinking different, remaining open-minded, and not being attached to a set way of doing things. Flowing, like water, has enabled us to grow and impact the world despite the adversity that we face along the way. Our newest initiative is Education is Life. The hope for this project has been to develop two schools in two different countries (Rwanda and Afghanistan), highlighting the importance of education. Zam Zam is not just about building water wells. Our mission is to create a better quality of life, and we believe education is an integral part of this complex equation. Solving complex problems doesn’t happen alone. 2017 has marked an important moment in our organization. We have crossed the chasm from being a small organization to having a strong footprint all over the world while still remaining 100% volunteer-based. We pride ourselves on the relationships we build with individuals and organizations, because nothing in this world can be achieved alone. In September of this year, an organization by the name of Paxful reached out to us in hopes of contributing to our Education is Life project, specifically the school we were building in Rwanda. Paxful, a Peer to Peer Bitcoin marketplace connecting buyers with sellers, has a mission to give working people a simple, fair and secure platform for trading the value of their work. Shortly after the team at Paxful contacted us, Zam Zam sent them a proposal that included the infrastructure of the school, the water well project, and the farming crop system. Paxful approved and sent us the funds in order to begin development of the school. You may be asking; what does a Bitcoin company have to do with Zam Zam Water? Paxful cares about corporate responsibility, and they believe that positive things can happen through Bitcoin. The Education is Life project is not only a model for what can be built with Bitcoin, but is a model for how we create and sustain successful corporate partnerships. Paxful was updated throughout every step of our development. Upon completion of the school, Paxful intended on visiting the site to see where their contributions went. The team at Zam Zam curated an entire four day trip from the moment Paxful landed in Rwanda to the moment they left. We were able to partner with local organizations to setup a gorilla trekking tour, a tour of the genocide memorial, as well as an entire day at village to get to know the people of Rwanda first-hand. Paxful wasn’t there to observe. They were there to serve. Throughout the trip the team at Paxful got their hands dirty and even contributed physical labor to the water projects. Two months after Paxful donated to the Education is Life cause, they were able to visit the site and realize the potential of partnering with Zam Zam. This is the spirit of partnership. It’s about transparency, authenticity, hard work, and pure intentions. This relationship with Paxful has enabled Zam Zam to venture out into deeper and stronger relationships with potential partners in the future. If interested in partnering up with Zam Zam, please contact Builtwithbitcoin@zamzamwater.org. Along with the Zam Zam volunteers, the newest addition to our team, Texas A&M University students joined us on this momentous trip to Rwanda. We are honored to welcome Kathryn, Monica, Erica, and Naveen and the Texas A&M Biological and Agricultural Engineering Department-Water Energy Food Nexus Initiative. Thanks to the efforts of Dr. Rabi Mohtar and Mary Schweitzer. Zam Zam has partnered with Texas A&M in an effort to conduct research and help design a more efficient and sustainable irrigation/filtration system in Rwanda. It was our absolute pleasure to have Texas A&M a part of this journey, Kathryn, Monica, Erica, and Naveen are great assets to our team. We are grateful to be able to benefit from their knowledge and expertise. Their presence enriched our experience in Rwanda. We look forward to our future projects with the Aggies and to see the impact they will have on the villages in Rwanda. Without a doubt, they have already made an impact on our team and the people of Rwanda. Not too long ago, the Zam Zam team took a trip to Rwanda - a country where your support has helped us build 6 water projects and a school. The purpose was twofold: first, to grow as individuals by meeting to the people that we serve and secondly, to bring back content that forges a connection between the people that we serve and our donors. As a member of the Creative team, it was my undertaking to bridge this gap. I was tasked with responsibility of capturing not just our projects but stories from the people. Stories from a different country that the rest of the world needed to hear. On our first day there we visited an old church that is now a historical genocide site. The story is that a large crowd of Tutsis sought refuge inside the church, all to be crossed by their Reverend, who informed the Hutu authorities to come and ransack the church. I walked in and immediately felt the presence of not just death but sheer savagery. The clothing of the victims were intentionally left there as a reminder. Not to mention the countless caskets and skulls that bore visible machete ruptures. As I walked out, emotionally taxed and regretful of what I allowed myself to see, I could hear the soothing sounds of children playing. There was a kindergarten school adjacent to the church and the kids all raced to high-five Yusuf. It was the starkest of contrasts. A polarizing interplay of life and death. Joy and pain. Past and future. Proof that, no matter what occurs, life goes on and runs its course. The cycle seizes for none. Ultimately, no tragedy can ever outrace time. In the picture above you’ll see a former perpetrator from the genocide (left) next to a victim (right). Believe it or not, these two individuals are now friends. They even take turns watching each other's children. After the Genocide, Rwanda launched an unprecedented reconciliation initiative where the perpetrators were to make amends and gradually be reestablished into the fold of society. The level of forgiveness displayed by the Rwandan victims is beyond comprehension. It’s almost hard to believe that the human heart is capable of such unparalleled mercy. We are too familiar with the evil capacities of the heart. Turn on the news and you’ll see a story that will make you lose hope in all of mankind. Rwandans have exposed us to the other end of the heart spectrum. At that moment I thought about all the grudges I have held with people. They had never felt more trivial. The genocide has been reconciled, however, Rwanda does not bury its past. They own it and will never forget even if they forgave. Even though the perpetrator has made amends and found atonement, the emotional scars of having spilt blood were still visible in his pensive facial expression and tight shoulders. Moving onto the victim - though she has pardoned, the emotional baggage of having lost both her parents in the genocide is still visible in her captivating eyes. I’ve always wondered how a society could mobilize thousands of people to kill mercilessly. After this trip, I found it even more puzzling as to how a society could mobilize thousands of people to pardon those very same killers. Between these two questions, we can find an answer for both. Human beings are born pure. Hate however, is a construct. Hate is the ingredient injected into peoples mind that cause them to lose all decency and humanity. If it can be taught, then it can be untaught. If it can be injected, then it can be extracted and replaced with love, which was the primary ingredient that the Rwandan government injected into the victim’s hearts when they encouraged them to pardon their perpetrators. As a first generation Afghan American, I come from land that has also seen far too much grief. With nearly 40 years of nonstop conflict with no foreseeable end, it’s hard to for me to imagine the light at the end of the tunnel. Rwanda serves as an exemplary model for how to move forward with conflict. Their reconciliation initiative paved way for them to heal from such a devastating catastrophe. Had Afghanistan, or any other war-torn country, taken a similar approach, then perhaps the situation would have been different? Rwandans have turned the most insurmountable of tragedy into triumph. They’re characterized by their warmth and cheer. Every last one of them has a story, from the politician, to the village chief, to the basket weaver that you passed by on the street. Their stories are engraved on their faces. When you look in their eyes, you see their past. All of the bloodshed. The grief. The heartbreaking tribulation. Conversely, when you look at their smiles, you see their future. The optimism. The hope. Their unwavering value for life. When we first landed, our tour guide said, “God travels the world all day, but He always comes home to Rwanda.” Initially this quote did not resonate with me. However, as I departed back home, I looked out the airplane window into the green and hilly landscape, one final time, and it all made sense. This is His home. This is God’s home. 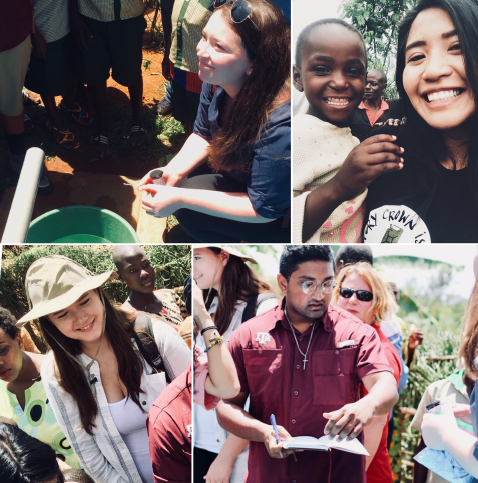 The opportunity to accompany the Zam Zam team to Rwanda was one of the most impactful experiences I have ever had. I left the trip with a genuine respect and admiration for the people and the country of Rwanda. Even after enduring so much hardship and tribulation, they were still some of the happiest and friendliest people I have ever met. Hearing their stories about how access to clean water had changed so many aspects of their lives, I left with a newfound appreciation for the work Zam Zam is doing and a desire to make our project as impactful as possible. I am so thankful to have been able to have been a part of this trip. Would I be welcome? Would it be difficult to assimilate to the country’s culture? These were questions that wracked my mind as we flew to Rwanda. However, as soon as we began to explore the country with Zam Zam, I could see how wrong my preconceived notions were. Never in my travels have I experienced a culture so inviting and met a people of such genuine kindness and warmth. It was initially difficult for me to rationalize how a people that have faced and still encounter such hardships could be so joyful and compassionate. Their collective countenance has forever left a profound impact on me. The people in Rwanda are some of the most deserving people I have ever had the pleasure to meet. The dedication of Yusuf and the whole Zam Zam team was clearly displayed every minute I spent with them. Aside from forever changing my world view and further highlighting the privileges in my life which I all too often take for granted, there was another much deeper and more profound effect that is difficult to explain. There were moments of intense sadness juxtaposed by moments of inexplicable joy. I shed tears of both pain and laughter, and I made connections with people I hope will last a lifetime. The people of Rwanda were immensely kind, forgiving and welcoming. Zam Zam’s dedication to serving these communities by creating greater access to water is truly making a difference for these incredible people. I would definitely recommend people to get involved in any way that they can, it will truly change your life in the best way possible. It’s incredibly difficult to consolidate my experiences in Rwanda into just one short paragraph. The people of Rwanda are the most original and genuine I have ever met. Despite the difficulties they have encountered, they still had bright, beaming smiles on their faces. Their positivity and forgiving demeanor have been an inspiration to me. Being able to meet these people and learn about their beautiful culture, alongside with the Zam Zam team, has been quite the honor. Zam Zam’s passion and commitment for serving the communities of Rwanda is evident through every action they take. This opportunity was absolutely amazing, and I am incredibly thankful to have been apart of it. Meet Felician. On our way to a village, we stopped by a water source used by locals and we met this villager. He works as a bricklayer, so he rides his bike 3km each way to fill up 5 jerry cans that weigh over 40 pounds. Felician lives in a village that Zam Zam has a water project in but does not to use the clean water to make bricks so he travels that distance 8 times a day to provide an income for his family. Meet our translator, Augustin. A product of a Rwandan mother and a Congolese father, his childhood was plagued with interracial disputes. While living in a refugee camp in Rwanda, Augustin’s father was killed by an assassin hired by his paternal uncle. Two years later his mother passed away from lung cancer. As the eldest of four and despite these tribulations, his demeanor is coated with an unwavering level of contentment and cheer. His father once told him that a man must accept his fate or else he will be defeated by it. Instead of giving up, he and his siblings have turned tribulation into triumph by excelling in their academics. “We’re okay, we all made it” he put. His uncle has reached out to him, provoking him to come and “avenge his father’s death,” however his heart has no space for vengeance or hate. Not an uncommon characteristic for people in this region.